Is Georgia Becoming A Battleground State? Hillary Clinton is riding high in the polls. How high? A poll released by the Atlanta Journal-Constitution on Friday found Clinton leading Trump in Georgia, 41 percent to 38 percent. That follows other Georgia polls published this week also showing a close race in the Peach State. A Democratic presidential nominee hasn’t carried Georgia since 1992. So how big a deal is it that Clinton could win Georgia? First, Trump is still a favorite in the state. He has a 55 percent chance to win there,1 according to our polls-only forecast, and a 72 percent chance per our polls-plus model. (Our now-cast for Georgia, which projects each candidate’s chances of winning a hypothetical election today, shows Clinton has a 59 percent chance.) Chances are that a Clinton win in Georgia would merely be an electoral cherry on top of an election blowout. Georgia has 16 electoral votes (tied for eighth most in the nation), but it has only between a 3 percent and a 4 percent chance of providing the decisive vote in the Electoral College, according to our models. 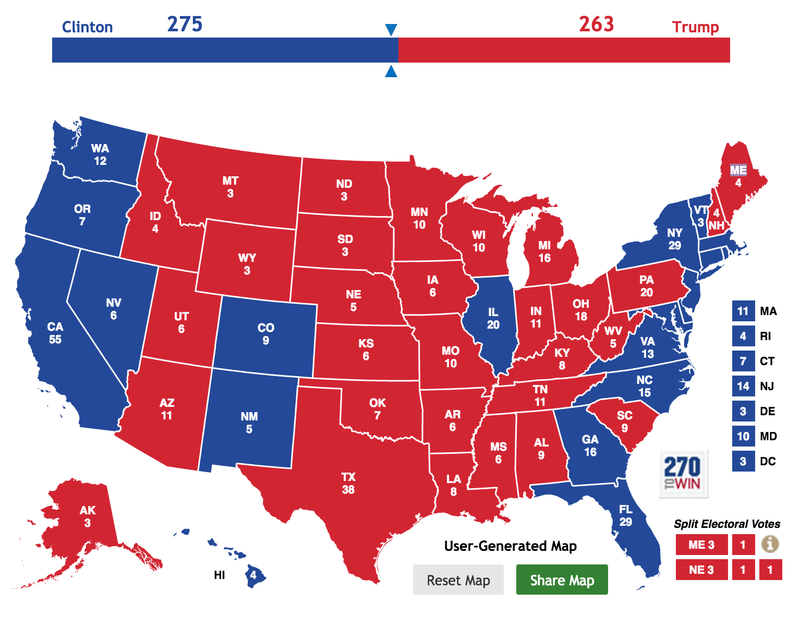 In these maps, Georgia is part of a “New South” backup plan for Clinton if Trump’s plan to win states in the Midwest and Northeast is successful. In these examples, you’d imagine Trump appealing to white voters without a college degree in states such as Iowa, New Hampshire, Ohio and Pennsylvania. Clinton then counters these victories by appealing to voters in the more diverse Southern states with growing populations, including Florida, Georgia, North Carolina and Virginia. All of these states are at least one-third nonwhite. The African-American population in Georgia, in particular, has grown a ton in recent years. Black voters made up just 23 percent of Georgia voters in the 2000 election compared with 30 percent in the 2012 election. Much of this growth has occurred in the Atlanta suburbs, in Rockdale and Clayton counties. Not surprisingly, those two counties are also first and fourth, respectively, in terms of the U.S. counties that trended the most Democratic from the 2000 to 2012 election. Of course, having a large minority population isn’t a guarantee that a state will go Democratic (see Alabama, Mississippi, Texas, etc.). The white population in most of these states leans overwhelmingly Republican, but a Democrat, in order to carry the state, has to do not terribly with white voters. In 2012, President Obama lost white voters by about 60 percentage points in Georgia. That’s better than he did in Alabama and Mississippi but not good enough to carry the state. Obama lost white voters by between 25 and 35 percentage points in Florida, North Carolina and Virginia in 2012, all states that were competitive that year. The AJC poll, meanwhile, has Clinton losing white voters by just 37 percentage points. That movement probably is because of voters with at least a college degree, as we are seeing nationwide. Clinton is winning college-educated voters by 11 percentage points according to the AJC poll, after Obama lost them by about 20 percentage points in Georgia in 2012. Clinton and Trump are tied among non-college-educated voters, which is about the same result as in 2012. Combine the trend of well-educated voters and Trump’s earning of just 2 percent of support black voters in the AJC poll, and Clinton has a real shot to win Georgia. CORRECTION (Aug. 5, 5:49 p.m.): Due to an editing error, a previous version of this article misstated the winner of the presidential election in North Carolina in 2012. It was Mitt Romney, not President Obama. All FiveThirtyEight model information spoken about in this piece is as of Aug. 5 at 2:45 p.m. Eastern Time.